Texas medical malpractice lawsuits can be filed against healthcare professional—including doctors, nurses, or organizations—who fail to provide an acceptable standard of care for patients. When a patient suffers harm as a result of a decrease in the standard of care, a Texas medical malpractice lawsuit may be filed against the doctor, health care provider, or institution, whose actions caused the harm. 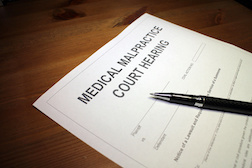 Included in medical malpractice claims are claims of medical negligence. Send your Texas Med Mal claim to a lawyer who will review your claim at NO COST or obligation. Medical negligence involves situations or circumstances where healthcare professionals fail to treat their patients in a way that meets accepted medical standards of care. Simply making an error or having treatment result in a negative outcome is not necessarily a malpractice situation. To be medical malpractice, the healthcare provider must have provided care (or failed to provide care) in a way that a reasonable, competent professional would not. In Texas, a claim of medical malpractice must establish that there was "willful and wanton negligence" involved. This means the medical professional has put the patient at extreme risk and was aware when providing medical care that they were putting the patient at risk. Patients are usually required to provide medical reports and diagnoses, testimony from experts, medical files and other related documents, and physical evidence to support their medical malpractice claims. Under Texas Medical Malpractice laws, the highest non-economic damages a person can received from doctors or individual healthcare providers is $250,000. The highest non-economic damages that can be received from any one hospital is also $250,000. In Houston, three medical malpractice lawsuits have been filed against an obstetrician accused of mismanaging births, resulting in the death of one infant and the severe disabilities of two others. According to the lawsuits the pregnancies were normal with no complications. The mothers have filed malpractice allegations against the doctor, the hospital they were treated at, and medical staff. From $20 Million to Fifty Bucks: Could the Same Thing Happen in Texas? Sulfa Drug Allergy Foundation for Medical Mal..